Description: Power rest over the weekend and will pick the following Monday morning for a return trip north. 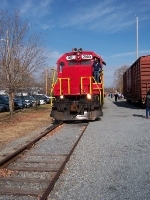 Description: GNRR 2000 rests after hauling the Blue Ridge Rwy. run to McCaysville. 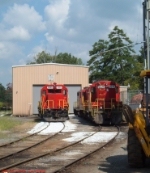 Description: GNRR Southbound Freight Train passing through Blackwells, Ga. 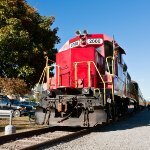 Description: GNRR Southbound Freight Train ( South Local ) passing through Blackwells, Ga. Description: GNRR Southbound Freight Train ( South Local ) passing through Westoak, Ga. Description: GNRR Southbound Freight Train passing through Westoak, Ga. Description: The "South Local" is at Elizabeth. Ex-Chicago Central unit leading. Description: South (left) & Elizabeth locals at Elizabeth. Description: This consist sounds as good as it looks!!! Awesome vintage power!! Description: GNRR shoves out of the way while G110 comes down the transfer track to leave the grain destined for a feed mill in Canton, GA. Description: The power cuts away from the train to go down to the switch to pickup one car that will be coming back with them. Title: Crewman handing off trainorders at Marr Ave. Description: Crewman handing off trainorders at Marr Ave. Description: View from cab of GNRR approaching bridge. Description: A frontal view of GNRR 2000 after round trip in Blue Ridge, GA. Not sure there is much need for the snow plow in Georgia.